This article is based on material first published in ProActive, the official industry newsletter of Lotus Engineering. It is used here with permission. Despite the global requirement to reduce CO2 emissions driving a move to the increased electrification of vehicles, the realities of economics provide a serious challenge for electric cars. Whereas stationary energy consumers do not require a significant energy storage capability, vehicles do - and current battery technology is both heavy and expensive. When compared to cars using a conventional liquid fuel powertrain, electric vehicles have four primary disadvantages: range, charge time, mass and cost. Primarily, these are all attributable to the use of a battery. Across the industry there is widespread research into new battery technologies - however, these may still be many years away from volume production. In the mean time, the range extended plug-in hybrid electric vehicle (RE­-PHEV) is a 'stepping stone' to a viable electric solution. In its simplest form, a range extender is a device used to charge an energy storage unit (normally a battery) in a series hybrid vehicle. The range extender charging device is typically a conventional internal combustion engine mated to a generator. However the use of a standard engine is inevitably a compromise and there are advantages in considering a dedicated range extender engine. The performance requirements of a range extender engine differ greatly, from engines developing as little as 15kW to those in excess of 150kW. Such a varied performance range is dependent on the strategy adopted for a particular vehicle. The required economy, performance and the specification of the vehicle all have an influence on the suitable range extender performance requirements. How does the Lotus Range Extender work within a series hybrid? A series hybrid provides drive to the wheels through an electric motor; there is no mechanical connection between the engine and the wheels. The electric motor is powered by a battery, and the purpose of the range extender is to charge the battery. The engine starts only when the state of charge of the battery drops below a certain point and continues to charge the battery until the state of charge is above a certain point. The battery size and type have a significant effect on the strategy of engine operation and performance requirement of the range extender. So how has Lotus tackled the range extender? In assessing the requirements for series hybrid vehicles, Lotus concluded that the use of existing conventional engines as range extenders is both too costly and too compromised to be viable. A specifically designed range extender is not just desirable but a necessity for an optimised series hybrid drivetrain. As a drivetrain component configured for reduced environmental impact, a key range extender specification is a high thermal efficiency for low fuel consumption. This can be achieved by an engine designed specifically for range-extender purposes. Series hybrid drivetrain currently face the challenge of higher costs than conventional powertrain and as such, the range extender also needs to be a low-cost engine. If it is carefully designed, the narrower operating range for optimised thermal efficiency can be achieved with a simple, low technology engine, which also can lead to the elimination of expensive exhaust aftertreatment. Simple engine architecture and technology specifications has the additional benefits of reducing engineering risk, cost and time to market. More issues facing series hybrid vehicles are vehicle weight and packaging. A low-mass, small package range extender is important as this not only improves the vehicle performance and efficiency, it also allows reduction of the size and capacity of the battery pack, a real benefit both for vehicle weight and cost. Also, it is necessary to keep the mass of the engine low since, depending on the vehicle's all-electric range and the user's drive cycle, the engine may only run infrequently, meaning that for much of the time the vehicle is carrying around what is, in effect, excess mass. Looking firstly at performance, Lotus conducted detailed simulations on various vehicle types from MPVs and sedans to sports cars. The results of these simulations have shown that a 35kW power rating will suit the drive cycle requirements of most C/D class vehicles, the class of vehicles that Lotus believes will be most popular for series hybrid applications. A typical four-stroke gasoline engine is at its most efficient around the 2,500 - 3,500rpm mark, so the Lotus Range Extender has been optimised to produce the required 35kW at 3,500rpm. In addition, different operating modes have been considered. These include power 'overboost' for times that may require additional power, and low-speed operation to provide a 'quiet in-town' running mode. The Lotus Range Extender is a spark ignition gasoline engine, with ethanol flex-fuel capability and is easily adaptable for CNG/LPG options. A spark ignition architecture was selected to avoid the significant aftertreatment costs associated with a diesel engine and to ensure suitability in all the major markets for initial plug-in hybrid uptake; in these markets diesel fuel may be less popular. The specifications of the Lotus Range Extender engine are shown in the table below. The chosen 1.2-litre engine capacity may initially appear large, particularly when compared to some engines being promoted as range extenders. However analysis has demonstrated that, when friction and pumping losses are considered, this displacement is optimal for the performance requirement. 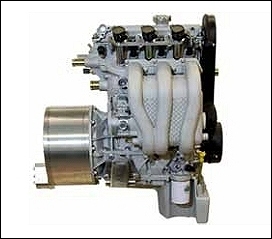 A smaller capacity engine could produce the required power, but would need a higher engine speed, so increasing friction, pumping losses and noise which in turn would negate the benefit. Alternatively, introducing additional engine technology such as forced induction could allow a smaller displacement but would incur greater cost and complexity. A key feature of the Lotus Range Extender engine architecture is the introduction of the monoblock design with an integrated exhaust manifold. The monoblock effectively combines the cylinder head and cylinder block of a conventional engine, reducing component count, complexity in assembly and improving durability, eliminating what is a critical joint (the head gasket). The integrated exhaust manifold improves efficiency, with reduced engine warm-up time for an emissions benefit. 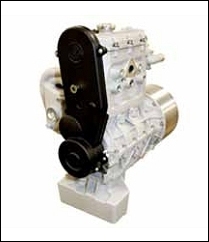 The crankcase is designed to allow simple modification of the casting to accommodate a variety of generator packages. The engine transfers power to the generator via a ‘dual damped' coupling, reducing NVH on engine start up and during power generation. The low engine speed means that only two valves/cylinder are required, simplifying engine manufacture and reducing costs. 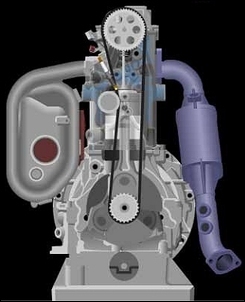 To improve engine efficiency, the combustion chamber is designed with an offset slant squish to focus the air-fuel mixture around the spark plug. The low engine speed again brings benefits by allowing the optimisation of the engine internals to minimise mass, with the bearings being designed for minimal friction. 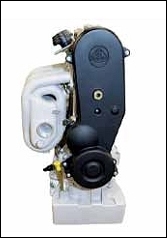 Conventional port fuel injection is utilised, rather than significantly more expensive direct injection. As the engine operates on fixed speed cycles, the benefits of direct injection are reduced to a point where an optimised port fuel injection system can provide similar efficiencies. A significant amount of investigative work was conducted on the number of cylinders required. Studies showed there was little difference between using two or three cylinders; each approach had inherent advantages and disadvantages. Ultimately a three cylinder configuration was chosen as there were minimal internal friction differences between the two options and the NVH of a two cylinder engine was seen as a significant downside. In fact, in a two cylinder design, a balance shaft would be a likely requirement for all applications, rather than an option as it is on the Lotus Range Extender. While a typical three cylinder conventional gasoline engine might have a mass of 80-90kg, as a result of its novel architecture and design features, the Lotus Range Extender is incredibly light, with a mass of only 56kg. Production optimisation should see this figure reduce further.